The Armory was built by architect, William Carbys Zimmerman. The addition to the Armory was designed by Charles A. Platt. 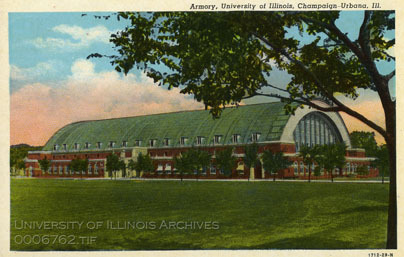 The armory building was completed in 1927 and is located in Champaign. The University of Illinois was founded with a land grant from the federal government in 1862 with the condition that instruction in military science and tactics would be given. The first building ever built on campus was the Drill Hall and Machine Shop where military activities were held until it burned down on June 9,1900 (7). In 1896, the Military Hall (now known as Kenney gymnasium) was built on Springfield and in 1899 was renamed the armory thus the many references to the “old armory” in literature (3). In the early 1900s, the Military Hall soon became inadequate to hold cadet training due to the number of student cadets. The location of Military Hall also posed a problem because of the time wasted marching back and forth from the Hall to the South Quad where the Military drills were executed. The solution to these problems was to build a facility that was large enough to accommodate the cadets and close enough to campus to be convenient to its primary users(3). Also in 1908, Foellinger Auditorium was completed but the student body quickly outgrew it and because of this, plans for a new Armory began(4). In 1911, Legislative passed the idea for a new armory. Original proposals from the supervising architects to place the Armory on the east side of Mathews Avenue met some backlash. The College of Agriculture protested against any location of buildings that would interfere with the permanent experimental plots. A Commission of architects was created for the plan pertaining to the Armory that included Mr. W.C. Zimmerman of Chicago, Chairman D.H Burnham of Chicago, and C.H Blackall of Boston (also from original class of ’77). After different campus plans proposed by various people, on February 2, 1912, C.H Blackall created a plan that placed the armory for the first time on the axis of 5th street and close to Armory Avenue, the site ultimately chosen by the commission. The plan met immediate favor as offering an opportunity for the retention of the agricultural plots, which had been repeatedly threatened because of the pressing need for building room (7). Ground was broken for the Armory Building on September 18, 1912 and was officially designed by Illinois state architect William Carbys Zimmerman. For a number of years, the building stood in an unfinished condition with only the central drill hall being built. Finally in 1925, legislature appropriated the necessary funds for completing the building, which was taken on by James White and Associate Architect Charles Platt (4). Platt followed the original plan to add rooms, corridors, and entrance features (7). The new work was in the Georgian style, thus bringing the earlier structure into architectural scale and harmony with the surrounding buildings such as the Main Library, Huff Hall, and others (6). The building was considered something of an engineering feat being the largest structure in the world without a center support at that time (1). The 98-foot-high ceiling suspended over 80,000 square feet of floor space is supported by 14 three-hinged arches with a centerpiece of the structure being the drill floor with spectator galleries. The entrances to the galleries were strategically placed in the towers so that audience members would not have to cross onto the drill floor at any time (4).The great drill hall of the armory was also one of the first permanent buildings erected in the area to the south of Foellinger (7). The old Armory was too small to hold an increasing number of students. After the original location proposal was rejected due to protests by the College of Agriculture, a commission of Architects was created for its design and construction which included William Carbys Zimmerman of Chicago, chairman D.H Burnham of Chicago, and C.H Blackall of Boston. 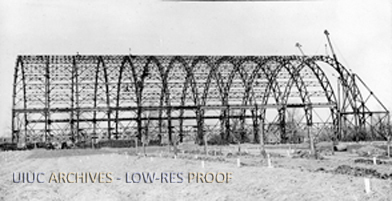 Its most unique feature is its large and long span structure without central support. The 98-foot-high ceiling, suspended over 80,000 square feet of floor space, is supported by three-hinged arches weighing 36 tons each (6). On April 20, 1920, 173 memorial trees were planted around the Armory in what was then known as Military Drill Field. Each tree is dedicated to one University of Illinois student who died in World War I (4). A few years later in 1927, Charles Platt designed the addition to the Armory and transformed it into a Georgian revival style, which harmonizes with the surrounding buildings such as the Main Library, Huff Hall, and others and reflects his classical style in design (6). 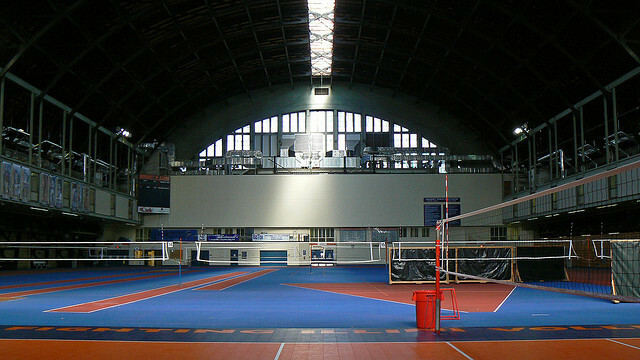 The Armory was originally designed as a military drill hall, an athletic facility, and an assembly hall (1). The Armory was largely used by the University's cadet regime, which was the largest in the country at the time. 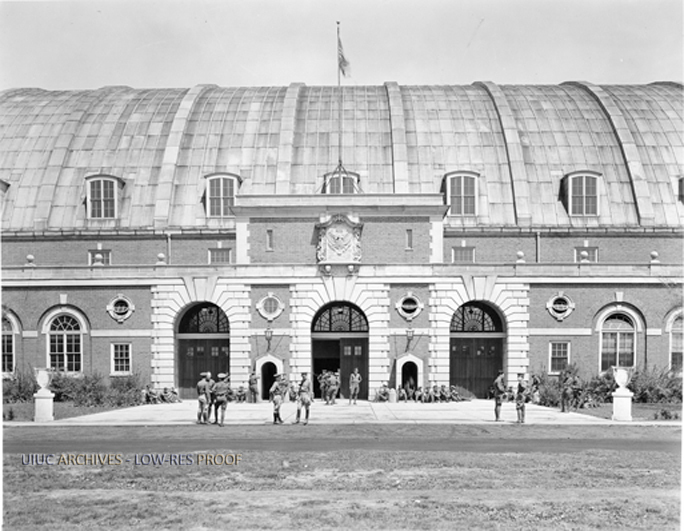 It provided a place for soldiers to train, storage for army equipment and resources, as well as housing for more than 2,000 soldiers during World War I (4). Today, the Armory Building houses the offices of several University of Illinois departments and units, including the Army ROTC, Air Force ROTC, Marine Corps and Navy ROTC. Numerous academic courses are also held in the classrooms. The central track is used by the Illinois track team for training and intercollegiate competitions; by the ROTC cadets and Police Training Institute for drills; and by University faculty, staff, and students for their daily exercise (6). William Carbys Zimmerman was the state architect for Illinois for nine years. He was a member of the Board of Examiners of architects (1897-1901) and a member of the Illinois Chapter of the American Institute of Architects (president 1902-1903) (5). He designed many public buildings in the East and Midwest including the Illinois State Prison in Joliet and the Pennsylvania State Prison. He designed many beautiful houses throughout Chicago and the suburbs. He designed Lincoln School in Highland Park in 1909 (2). Charles A. Platt, was a prominent artist, landscape gardener, landscape designer, and architect of the "American Renaissance" movement, pursuing the classical tradition in architecture. He is best remembered today for his landscape and country house designs, but also nationally known for his sketching, landscape paintings, commercial architecture, and institutional projects(2). He was a trustee of American Academy in Rome and served as vice chairman at U.S commission of Fine Arts. • Freer Gallery of Art palazzo, Smithsonian Institution, Washington, D.C.
Jinfan Bai, Arianne Muelhausen, and Weiye Sun, “The Armory,” ExploreCU, accessed April 20, 2019, https://explorecu.org/items/show/288. 1. "Campus Landmarks." Illinois.edu. University of Illinois at Urbana-Champaign, n.d. Web. 03 Nov. 2013. 2. “Charles A. Platts”, Columbia University Libraries/Information Services http://library.columbia.edu/locations/avery/da/collections/platt.html 3. Huth, Jeff. "The Armory's History Has Deep Military Roots." The Champaign- Urbana News Gazette 4 Nov. 1984, Time Out sec. : n. pag. Print. 4. Leetaru, Kalev. "New Armory." 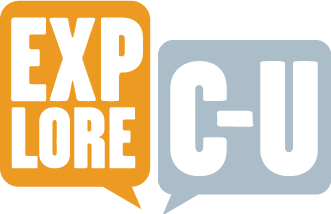 UIHistories Project. N.p., 2011. Web. 03 Nov. 2013.http://uihistories.library.illinois.edu/cgi-bin/cview?SITEID=1 5. Leonard, John W., and Albert N. Marquis. The Book of Chicagoans : A Biographical Dictionary of Leading Living Men and Women of the City of Chicago. Vol. 1917. Chicago: A.N. Marquis, 1905. Print. 6. 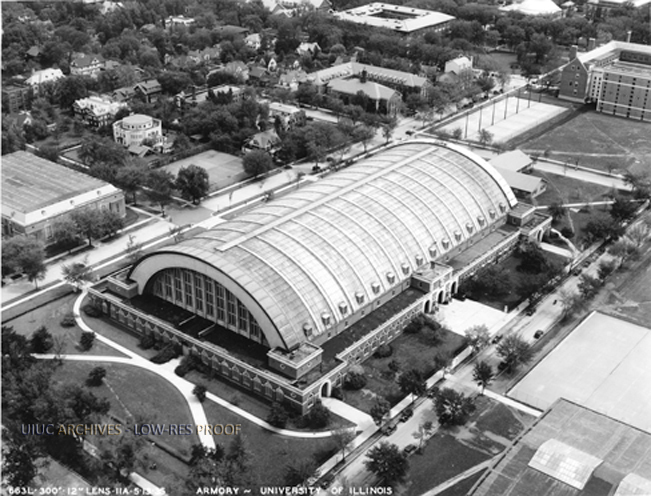 "The Armory Building at the University of Illinois." ACDIS.illinois.edu. The Program in Arms Control, Disarmament, and International Security International Programs and Studies, 30 Oct. 2013. Web. 03 Nov. 2013.http://acdis.illinois.edu/aboutacdis/armorybuilding.html 7. Tilton, Leon D., and Thomas E. O'Donnell. History of the Growth and Development of the Campus of the University of Illinois,. Urbana: University of Illinois, 1930. Print. 8. "Zimmerman, William Carbys." Archiplanet.org. N.p., 10 May 2008. Web. 03 Nov. 2013.